ENHANCE Gaming's LED Mouse pad combines dynamic ambient lighting with the smooth high precision surface of a rigid gaming mouse. Feel the difference that an XL gaming mouse can provide, see the ambient lighting transform your desk, and experience ENHANCE gaming. 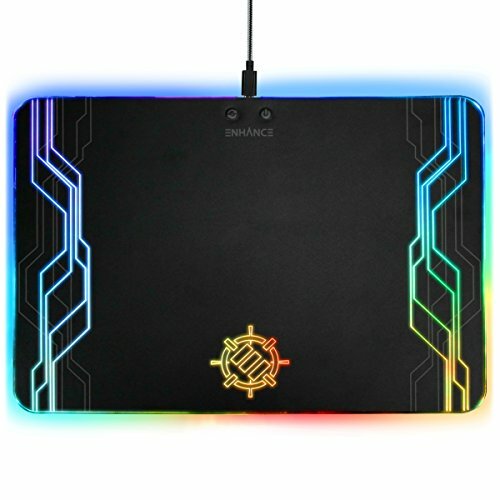 Our LED Gaming Mouse Pad has 7 different color settings: Red, Blue, Purple, Green, Teal, Fade, & Rainbow. Select a solid color or choose Fade to see all the colors fade in and out and Rainbow to see all colors at once. Each setting can be adjusted to one of 3 brightness settings to provide the best ambient lighting for your gaming set up. Smooth and Sleek, our LED Mouse Pad offers accurate mouse tracking on a dark decal laden surface. Line up your shots, perform a quick 360 turn, or do a barrel roll with precision accuracy and speed. Our mouse pad also features transparent modern decals that shine with LED lights. The ambient lighting is emitted from the mouse pads edges as well as from the surface itself. Our Mouse Pad features a flat button control panel that blends seamlessly to the rest of the surface. Other LED mouse pads use a thick power channel block that obstructs your mouse when making a quick upward movement, potentially ruining your game session. The flat button design was implemented to create unobstructive gameplay and aesthetic appeal. ENHANCE your game with our LED gaming mouse pad. If you have any questions about this product by ENHANCE, contact us by completing and submitting the form below. If you are looking for a specif part number, please include it with your message.